Hanging Mini Diffusers - NEW! My daughter is a dancer and is only 13. Often she is required to wear makeup to performances and I have been more than impressed with the switch to natural makeup as my daughter has had less breakouts of her skin, the blend colour match to her skin and also the natural look the makeup gives. I will definitely continue to use natural makeup products. I found Livinia Mineral Crème Foundation to be very light on my skin, it did not feel gluggy or heavy like my normal make-up. I suffer from acne at times, but this product does not irritate my skin at all. 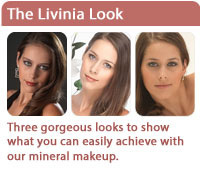 I am now a convert to natural mineral-makeup and will be purchasing more products from the Livinia Range in future. I purchased "Ellie Lipgloss" from the Livinia Range. I love the colour, it was well packaged and presented, and I carry it everywhere I go for touch-ups. It's long wearing and reasonably priced. I recently purchased some of the Livinia lip pencils and found them to be of excellent quality. So far I have not had to sharpen them, which is great, as other brands usually break easily and have to be sharpened often. The shades are also nice and I will definitely by trying other products in this range. There is no foundation on earth like your foundation – flawless and incredible coverage. Wow!! Debbie, I can't tell you how much I'm loving your make-up, my skin hasn't looked this good in years. Thank you, Thank you, Thank you. I have now been using Livinia Mineral Make up for 18 months and just love it. Since using Livinia Mineral Make Up, my skin has also improved. The makeup is so natural looking. I love that the foundations are so light to wear you don’t even feel like you are wearing any foundation. Even on the hottest of days, I have worn the foundations and have been amazed that my skin still feels like it is breathing and does not get sweaty or shiny. It is just beautiful all day and night. Thank you for creating a wonderfully easy and natural product. I have found Livinia mineral make up wonderful for my mature skin. It covers my skin spots and blemishes easily, and looks so natural. The kabuki brush makes it easy to apply as lightly or as heavy as I want. After trying your mineral foundation, I was amazed at the coverage and how natural it looks on my skin. I personally am not a wearer of foundation as it usually clogs pores and looks too heavy on my skin; however I cannot live without your mineral foundation in shade Honey. Thanks for developing such a perfect product. I will be a loyal fan forever. I received my new makeup yesterday, thank you for sending it out so quickly for me. I was having a 'at home' day today and thought I'd better try applying it, as tomorrow I am back at work. I have to say, I love it!!!!!!!! I am surprised at the great coverage it gives and the lovely natural feel to the makeup. I am thrilled knowing that I am putting something so natural on my face. You have gained a life-long customer. I will recommend your company to like minded friends too. Thank you again Debbie for your lovely, friendly service and I hope your company continues to grow to be a great success for you. I have been using Livinia eye shadows for a couple of months and am amazed by the quality and intense colour. They are easy to apply and blend beautifully with the dual liner brush. With my evening wear I apply them with a wet brush and they are absolutely stunning. I particularly like amethyst and smoke. Thanks for creating such beautiful colours and I look forward to trying more soon. Journeywoman is tired of transferring liquid foundation into those little plastic bottles just so the folks at airport customs will allow us to take our make-up on board. At a recent trade show we were introduced to the perfect solution -- Livinia Pure Mineral Make-up from Australia distributed in North America by Organic Evolution. I admit I was a bit skeptical at first but they offered to do a make-over for me. Oh my goodness, I was so impressed with how natural these crushed minerals looked (especially smitten with the intense shade of their amethyst mineral eyeshadow), how it felt on my skin, and the fact that it was 100% vegan friendly and suitable for sensitive skin. Best of all -- good-bye liquids, good-bye mess, good-bye little plastic baggies. From now on Livinia Pure Mineral Make-up is the only way to travel. The Green Gala is proof of how easy it is to celebrate fashion and beauty while maintaining green values... The hair and makeup was a key player in lightening the environmental footprint of the fashion show. All the hair styles were done without the aid of hot tools and the makeup was completely eco friendly and often organic. The Livinia line is a fabulous example of luxurious cosmetics that perform brilliantly, feel fantastic on the skin and are made with organic ingredients.